Saint Pelagia the Penitent was converted to Christianity by Saint Nonnus, Bishop of Edessa (Saturday of Cheesefare Week). Before her acceptance of Christianity through Baptism, Pelagia was head of a dance troupe in Palestinian Antioch, living a life of frivolity and prostitution. One day Pelagia, elegantly dressed, was making her way past a church where Saint Nonnus was preaching a sermon. Believers turned their faces away from the sinner, but the bishop glanced after her. Struck by the outer beauty of Pelagia and having foreseen the spiritual greatness within her, the saint prayed in his cell for a long time to the Lord for the sinner. He told his fellow bishops that the prostitute put them all to shame. He explained that she took great care to adorn her body in order to appear beautiful in the eyes of men. “We... take no thought for the adornment of our wretched souls,” he said. On the following day, when Saint Nonnus was teaching in the church about the dread Last Judgment and its consequences, Pelagia came. The teaching made a tremendous impression upon her.With the fear of God and weeping tears of repentance, she asked the saint for Baptism. Seeing her sincere and full repentance, Bishop Nonnus baptized her. By night the devil appeared to Pelagia, urging her to return to her former life. The saint prayed, signed herself with the Sign of the Cross, and the devil vanished. 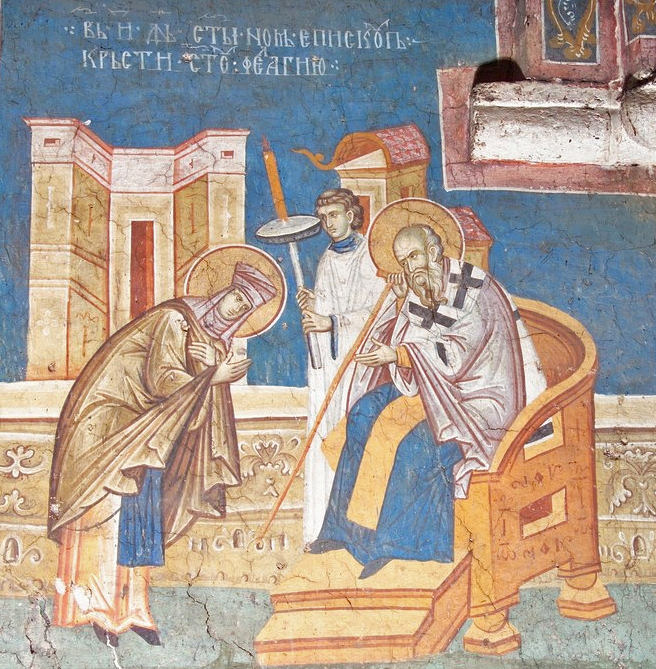 Three days after her baptism, Saint Pelagia gathered up her valuables and took them to Bishop Nonnus. The bishop ordered that they be distributed among the poor saying, “Let this be wisely dispersed, so that these riches gained by sin may become a wealth of righteousness.” After this Saint Pelagia journeyed to Jerusalem to the Mount of Olives. She lived there in a cell, disguised as the monk Pelagius, living in ascetic seclusion, and attaining great spiritual gifts. When she died, she was buried in her cell. The image of God was truly preserved in you, O Mother, / for you took up the Cross and followed Christ. / By so doing doing you taught us to disregard the flesh for it passes away / but to care instead for the soul, since it is immortal. / Therefore your spirit, venerable Pelagia, rejoices with the angels.